With proper testing I see that the FiboGroup– is the honest broker and easy to deal with. You can be sure they will grant you a good trading community. I can be sure to invite other friends here as I see them to be great. Now they offer interesting bonus Traders’ mission – POSSIBLE!, 125-200% and not for new clients only . but for active too))) Thanks FiboGroup! FiboGroup was founded in 1998, the company is regulated by The Financial Services Commission (FSC). They are one of the oldest broker which provide marginal internet trading to their customers. You can trade forex, stocks, commodities and other with them. Their activities is to protect the interests of their customers with high security of their accounts and payments. They have high international standard and are under the control of many national regulators. They have a lot of history behind them, so you can trust them. The company is listed also in British Virgin Islands, Republic of Cyprus and Australia, so you can be sure that they will never lie you for anything. The trading conditions is very good, because you can open your account in four different types with different trading conditions. The minimum deposit for MetaTrader 4 NDD is only $50, the maximum leverage can be up to 1:400. For the other account types the minimum deposit is $300 with maximum leverage up to 1:200. Each account type have advantages depends on what customers want. You can deposit and withdraw with different types of payments options such as Neteller, Wire Transfer, Visa, Payoneer, Webmoney, Okpay, Fasapay and many other. When you open your account, you will receive a lot of tutorials for novice traders, chance for Pamm account with high profitability for traders and investors. 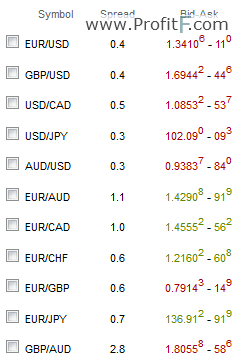 The spreads are very tight depends on which account type you will choose. Every week they have contest for the traders and the winners receive bonuses to their accounts. If you deposit and open a real trading account MT4 Fixed or MT4 Floating, you can receive up to 25% bonus. The only condition is the deposited amount to be minimum of 10 000 USD.